This is just the book I've been looking for! 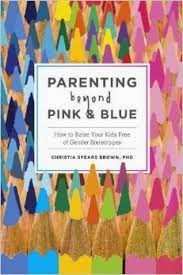 This is definitely worth reading for parents who are concerned about how to address gender with their children and how to not make widely-spread assumptions that don't have to be true if we just raise our children with more knowledge. Carefully researched by a developmental psychologist who focused on gender similarities/differences during her PhD, I found myself trusting what she had to say (not so much on areas where she gave advice outside her area of study.) She spoke of complexities and subtleties in the area of gender while other areas where she gave parenting advice lacked the same nuances. She found that most of the differences between boys and girls are small and become exacerbated by the way we treat them. She recommended de-genderizing our treatment of children as much as possible, referring to them as "kids" rather than "boys and girls." Even the simple mention of gender without any obvious value judgments tagged to them can make kids more prone to gender stereotypes. According to the meta-analyses of hundred studies, boys are "slightly less able to suppress inappropriate responses and slightly more exuberant than girls." Gender difference in math is not in ability, but in confidence level. Girls feel less confident about their math abilities than boys even though they score the same on standardized tests and earn higher grades through high school. Girls tend to acquire language earlier than boys, but their verbal ability evens out as they get older. Girls are also more likely to praise or agree with someone when talking whereas boys are more likely to assert something or disagree. Girls are more likely to be unhappy with their body image than boys. Provoked physical aggression was the same across genders. It was only unprovoked physical aggression that was higher in boys (though I question how they knew it was unprovoked from the viewpoint of those boys.) All these differences are fairly minor and are exacerbated by different treatment of the two genders. The single biggest difference was play styles. Boys were more likely to play team sports while girls were more likely to play one on one games such as jump rope or hopscotch. The most significant difference to me is how the conversational style of boys and girls is different because this is something I've noticed. Boys tend to assert more and be more aggressive in conversations while girls avoid disagreement more. I would have thought this is something that we've been trained to do. So I was surprised that this difference could be found early on. I have to admit, after first reading this book, I became more conscientious of using gender neutral phrases. But I found it surprisingly difficult and reverted back to habit as time went on. The question also arose in me, kids are going to notice boy/girl differences. Is it really so bad to instill positive values in whatever gender they happen to be? The drink I would suggest to pair with this reading is milk. Coming in a neutral white color and something that every baby drinks, what drink could be more gender-neutral than that? I'm going to remember this every time I drink milk!